Established as a desert hideaway for Hollywood celebs and moguls in the 1930s, Palm Springs has developed into the premier wintertime gay resort town on the West Coast in recent decades. There are more gay-exclusive (and clothing-optional) resorts here than any city in the world, not to mention a considerable number of gay bars, restaurants, and shops with strong gay followings. This compact city of about 50,000 is also a popular draw for fans of casino gaming, golfing, and hiking, and the city has enjoyed a considerable spike in popularity and trendiness just in the past few years. 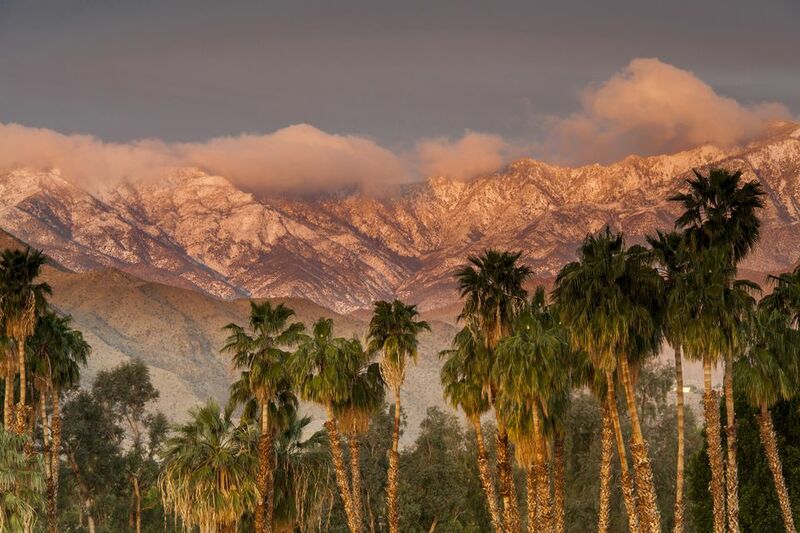 Palm Springs is busiest when it's coolest, in the winter - officially, it's high season from about November through April, and low season from June through September. May and October fall somewhere in the middle. Average high temperatures in January and February are about 70 degrees F, with nighttime lows dipping into the mid-40s. During the slower summer season, from June through September, highs average between 100 and 105 degrees, with nighttime lows in the mid-70s. Year-round, Palm Springs is consistently dry and sunny. Rain is a rarity, with most months averaging less than a half-inch of precipitation. Palm Springs sits in the Coachella Valley, fringing the San Jacinto Mountains (which rise to higher than 10,000 feet). The city is part of a popular vacation-driven valley consisting of the towns of Cathedral City (which also has several gay-oriented businesses), Rancho Mirage, Palm Desert, La Quinta, and Indio. Many of the gay resorts are clustered together in a neighborhood called Warm Sands, on the southeast side of downtown; a few more are in the San Lorenzo Road area, just a 10-minute walk farther south. Palm Springs also has a great variety of gay nightclubs and bars. Palm Springs Airport, which is just a five-minute drive from downtown, is served by Allegiant Air, Alaska Airlines, American, Delta, Horizon, Sun Country, United, Westjet (to western Canada) and several smaller airlines (some of them seasonal). Flying here can be a bit pricey, because this is one of the largest airports in the West not served by the discount airline Southwest. It can be significantly cheaper to fly into Ontario Airport, an hour west, which is served by Southwest Airlines along with all the majors. Early to mid-Jan.: Palm Springs International Film Festival. Mid- to late Feb.: International Bear Convergence. Mid- to late Feb.: Palm Springs Modernism Week. Early Mar. : Palm Springs Lesbian Book Festival. Early Apr. : Dinah Shore Weekend and Palm Springs Women's Weekend/ANA Inspiration Golf Championship. Late Apr. : Coachella Valley Music and Arts Festival. Early May: ​Palm Springs White Party. Late May to early June: Palm Springs Restaurant Week. June to mid-Sept.: Palm Springs Summer Splash. Mid-June: Palm Springs Desert Romp Clothing-Optional Pool Party Weekend. Late June: Palm Springs International ShortFest. Late Sept.: Palm Springs Gay & Lesbian Film Festival. Mid-Oct.: Palm Springs Women's Jazz Festival. Early Nov.: Greater Palm Springs Gay Pride. Apart from partaking of gay revelry, Palm Springs offers a nice balance of indoor and outdoor activities. For outdoorsy types, there's great hiking at Joshua Tree National Park, which is about an hour's drive away, and for a dramatic view of the region, you can take the Palm Springs Aerial Tramway to 10,500-foot-high San Jacinto Peak. Other draws include Living Desert park, the Palm Springs Desert Museum, the impressive Desert Hills Premium outlet mall and nearby Morongo Casino Resort & Spa, and downtown Palm Springs's snazzy Spa Resort Casino. A number of resources out there offer extensive information on the city's gay scene, including the very handy site Gay Desert Guide (which also powers the events page for the Desert Gay Tourism Guild, another excellent resource), the online LGBT guide produced by the Palm Springs Bureau of Tourism, the weekly Desert Daily Guide, and the Rage Monthly magazine. This sun-baked city in the desert mountains of Southern California differs from other major gay resort destinations in several ways. Most of the other biggies (Provincetown, Fort Lauderdale, Key West, Rehoboth Beach) are in the eastern United States and also on the ocean, a notable exception being California's other big gay resort area, the Russian River. And other than Fort Lauderdale, no other U.S. gay vacation destination is more sexually charged. The majority of the gay resorts in Palm Springs draw a nearly or entirely gay-male clientele and have clothing-optional policies, and some of these places are downright, hard-core cruisy. There are also a couple of women's resorts (also clothing-optional), but Palm Springs also has mainstream but gay-friendly resorts (complete with fancy spas, golf courses, sprawling pools, and other recreational and entertainment amenities) as well as a number of hip, cool boutique hotels that draw a predominantly straight clientele but couldn't be more gay-friendly. So although the gay-only resorts get most of the attention in the gay press, you'll actually find a wide variety of accommodations here. During the winter high-season, kicking off with Palm Springs Gay Pride in early November, the community buzzes with LGBT visitors and seasonal residents. Lodging rates are highest at this time, often dipping 25 percent or more in summer. If you visit during the slower times, you'll also notice fewer patrons at the roughly many Palm Springs gay bars and nightclubs and at many restaurants. Couples simply aiming to relax and spend time together often favor the slower summer months. Singles as well as couples looking to mingle and party definitely favor winter, and especially love visiting P.S. in April, when the two biggest queer parties of the year occur: the Dinah Shore Weekend/Palm Springs Women's Weekend (for lesbians) and the White Party Spring Break (for gay men). A popular destination among retirees, Palm Springs has also long drawn significant numbers of over-50 gay men and lesbians, both as full- and part-time residents and as vacationers. Generally, the demographic at bars and restaurants throughout the year tends toward the 40s-and-older set, but during high-season weekends and special events you'll find a more age-varied crowd. What Is the Weather Like in Palm Springs?